A strong brand should create meaningful experiences between your company and its target audiences. While the visual components of a brand — logos, marketing materials, etc. — can serve to support that goal, you will find it difficult to connect with your audiences if the visual experience is not supported by appropriate messaging in a relatable, human tone of voice. A strong Messaging Strategy can help you better define your audiences and craft focused messages for them in an intentional tone of voice. Here are a few exercises that will help you assemble your own strategy once you’ve identified your target audiences. Effective communication with your Target Audiences requires a tailored approach. It’s not enough just to say “we want to appeal to Tourists.” After all, there are many types of tourists: leisure travelers, cultural explorers, and ecotourists just to name a few. You need to drill down as far as you can within your audience segments to ensure you tie your messaging strategy to the right people. Creating a set of Audience Personas will help you better define the specific backgrounds, needs, and wants of your audience segments. And you can create Personas either by being aspirational and defining the ideal types of customers you want to have or you can survey actual people within your audience. Ask yourself, what do these people have in common? Where do they come from? What do they care about? How can our brand meet their needs or wants? Use the resulting answers to build representative stand-in for each segment and be sure to give them a name! 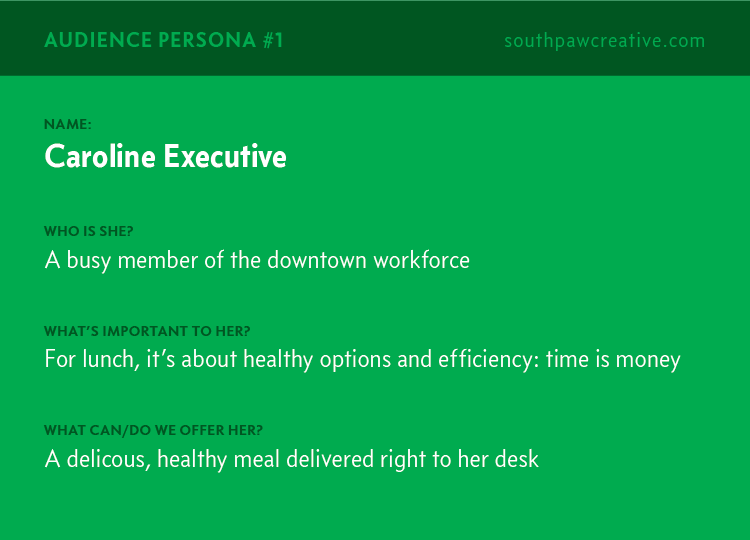 Here is an Audience Persona example built using a fake a brand — a healthy lunch spot — for illustrative purposes. If you find that you need more than one Persona per audience segment, consider splitting or sub-dividing it. Now that you’ve given your audiences a bit more definition, it’s time to outline what you’re going to say to them. Building a set of Key Messages — the most essential ideas that you need to communicate about your company — will keep your facts and talking points in line. 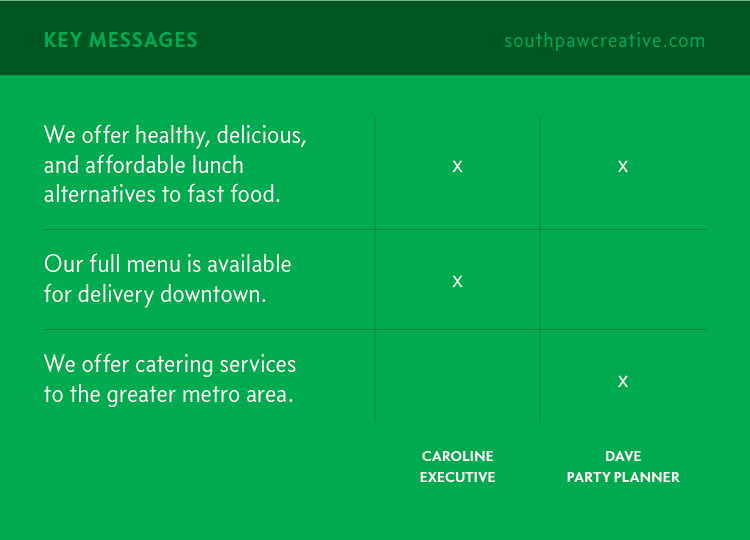 Once you have these messages organized, it is essential to cross-reference them to your Audience Personas. After all, depending on your company’s offerings, not everyone may need to hear the same messages. This steps helps to ensure that aren’t bombarding any of your audiences with extraneous information. Here is a Key Message table built again using the above fake brand and cross-referenced against two Audience Personas, Caroline and Dave. The amount of messages you need will depend largely on the complexity of your company’s offerings, but try to distill your content into as few messages as possible. You know who you’re talking to and what you need to say to them, but there’s still one missing piece to an effective Messaging Strategy: how are you going to communicate those messages. Developing an appropriate Tone of Voice will help you translate bland, corporate verbiage into stronger, more relatable messaging, which is key to building trust and making a more human connection to your audience. The goal is to choose three attributes and define them in a way that will steer you and your team toward the ideal resonance. For this exercise, I find it helps to consider the brand as you might a person. How would that person sound if you met them? What would their demeanor be? How might they be dressed? Here is an Attribute breakdown built with the above fake brand in mind. Be sure to include rationalization (answer “Why this attribute?”) as well as at least one example of how to translate the intent of the Attribute into copy. These exercises — Audience Personas, Key Messages, and Attributes — combine to create your Messaging Strategy. 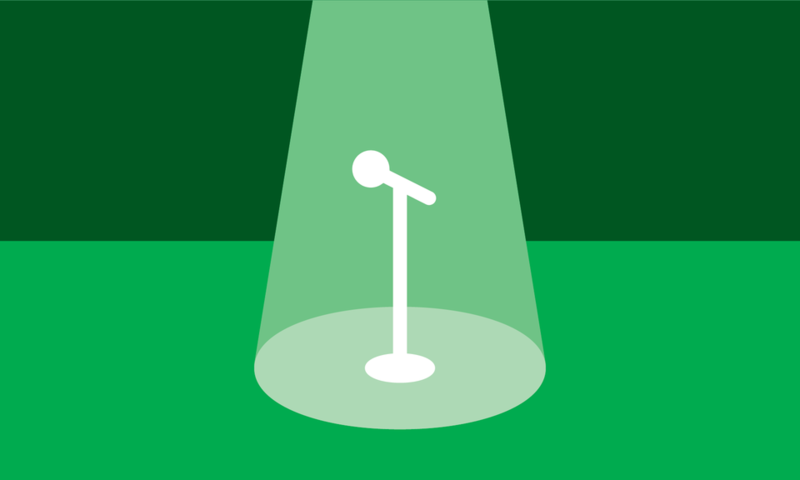 Lay them out in a short document and share them with every member of your team who will be speaking or crafting messaging on your company’s behalf. Keeping the document clear, and easy-to-use will help to ensure that all of these disparate voices will come together and effectively support and reinforce your brand. Now get out there, and spread the word! This article originally appeared in the January 2017 issue of In Good Company, a quarterly magazine for the policyholders of one of our longtime clients, LCI Workers' Comp. If your business or organization would benefit from a process like this, please get in touch and we can start rethinking and revitalizing your messaging strategy.